On a recent trip to Nepal – Bhutan – Hong Kong, I couldn’t resist buying some stationary to add to my favorites (see picture below). What stationary/teaching aids could you NOT do without? Games that engage student have (from my experience) a balance of skill and luck. All students should believe that they have a chance of winning. The game should involve a number of choices to be made. So here is the board and rules for “Dominotion”. 1. Ten dominoes are drawn (one at a time) from a double-15 set. 2. Players place each pair of numbers on the board. They may be horizontal or vertical with the two numbers in either order. 3. Eight dominoes are placed on the grid and two dominoes are discarded. 4. Each row and column is scored (eight scores). 5. The winner has the highest total. What strategies would you use? What is a good score? Any feedback would be appreciated. I have just watched the film Hidden Figures. It tells the story of three African American women mathematicians at NASA—Katherine Johnson, Dorothy Vaughn, and Mary Jackson—who were instrumental in “doing the math” that allowed John Glenn to be the first American to orbit Earth. The film is based on Margot Shetterly’s book, Hidden Figures. If you are a Maths educator or student you should definitely watch this film. It breaks the stereotype that men make better Engineers/Scientists/Mathematicians. I already know that this stereotype is wrong, because I have worked with and still work with excellent female Mathematicians and Mathematics teachers. But seriously, watch the movie, it is damn good. Be prepared though for many reminders of colored segregation and discrimination in the 1960’s. For a much more comprehensive review, check out Science News for Students. When I started teaching Maths (37 years ago!) my mentors impressed on me the importance of getting a lesson off to a good start. As a result, my students know that as soon as they sit down they are expected to start work. Apart from forming good work habits and learning Maths, this immediate use of a “warmup” allows the teacher to complete his/her admin duties. For example: roll marking, checking uniform and equipment, deal with late arrivals, read daily bulletin, etc. Although I use WODB, Would You Rather, etc., my preference is for 10 quick questions. These should be graduated in difficulty from easy to challenging. I have nearly finished creating “50 Warmups for Secondary School Students”. One of my students contributed two drawings – a boy and a girl character as shown above. She named them Mandy and Drew! Below is a sample – let me know what you think? Anybody who knows me, can easily see I have a passion for playing games. A fellow teacher starts each school day trying to beat me at “Stop or Dare”. At the end of a teaching day Maths teachers and the odd English teacher gather for a game of “Liar’s Dice”. WHY? I have now gathered over 100 games that I have tried in the classroom. Three are originals invented by yours truly: domino squares, operation golf and salute the king. Click the image at right to download. Hope you enjoy playing. Let me know your favourites! As usual during the summer holidays I get sick of gardening and housework and can’t wait to get back to school. Fortunately, I have 90 Mathematics teaching blogs in my RSS reader. These give me plenty of inspiration, as well as teaching ideas and resources. 1. Add Em Up Review Activity by Sara Vanderwerf. Her goal is to get students talking about Maths! Make sure you check out her 1 to 100 activity also – a great way to get group work going with a new class. 2. Putting Stats Projects into Practice by Amy Hogan. We are implementing common assessment tasks this year. This post gives great advice on ten important features of doing Projects in the classroom. 3. Visual Patterns and Coding by Adrian Pumphrey. I intend to continue using the excellent Visual Patterns website and now I will add some programming with Skulptor and graphing with Desmos. 4. Creating a Positive Learning Environment by Mo Ladak where he gives 22 great strategies to help achieve this. Well worth a read! 5. Learning Mathematics: the struggle, the tools and the way forward by Michaela Epstein. This up and coming star Aussie teacher is a product of the fantastic TFA program. Watch her presentation from the Transform Ed conference. 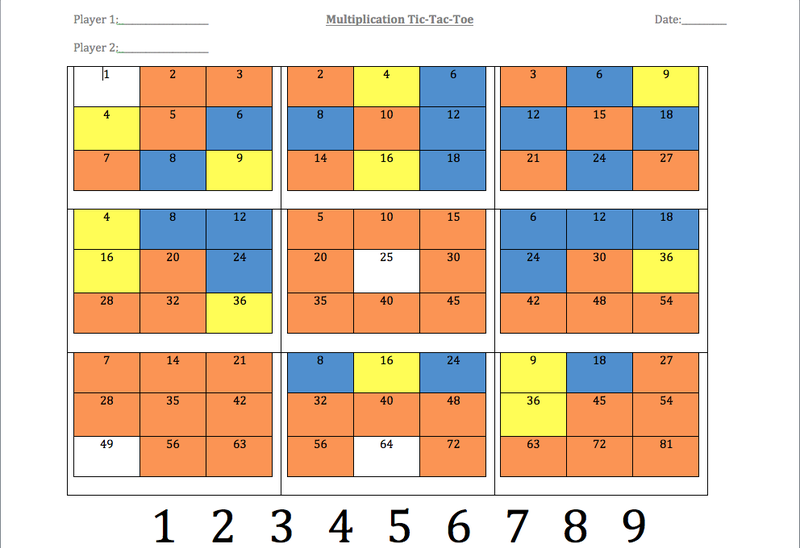 Provide a pair of students with a multiplication-tic-tac-toe-blank. Get them to write in the first 9 multiples in each part of the board. The obvious advantage to doing this is the practice at writing multiples and developing an understanding of the game board. This is the main event! Lots of games needed to improve multiplication facts and developing game strategy. For game rules see artofmathstudio. Get students to colour in the board as follows: blue represents “quadruple plays”, yellow’s represent “triple plays”, oranges represent “double plays”, and white represents “single plays. Get students to explain their strategies for winning the game (written or verbal). Do you think that the “3 Act” structure lends itself to all games or only to this particular game? A teacher runs across the room, jumps in the air and falls to the ground with his fists punching the floor, yelling “hulk smash”. 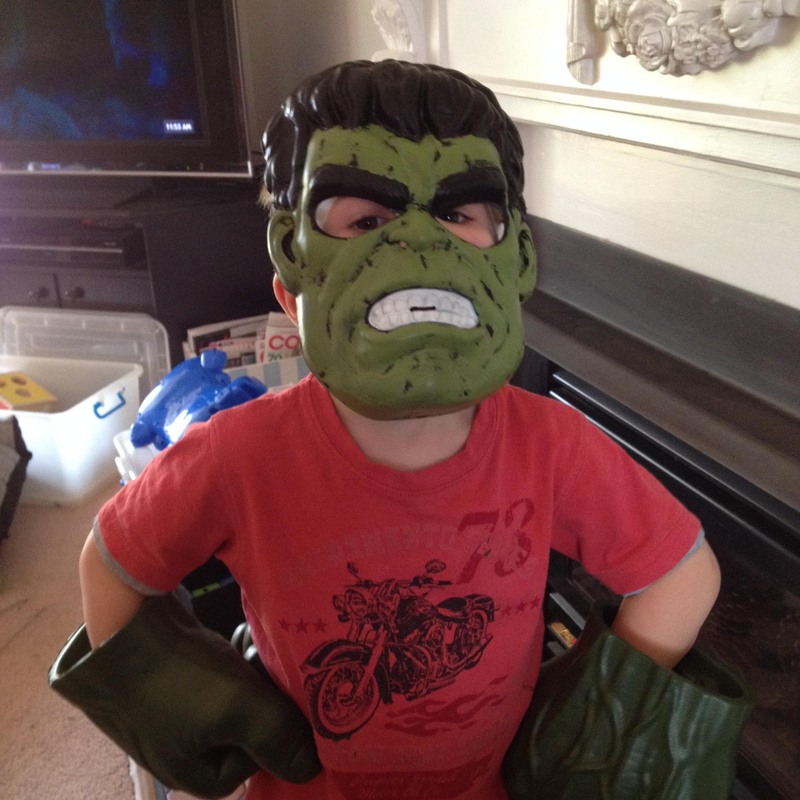 For greater effect he would have a hulk mask and hulk hands like my 3 year old grandson! Then onto introducing the lesson (Volume of Prisms) and using Hulk vs. Red Hulk worksheets by mej – solvemymaths.